Arrow from an illustration in the Beauchamp Pageant, taken to be typical of the period of the Wars of the Roses through to the decline of military archery under Elizabeth I and James VI et I. It’s probably also a good representation of bob-tail arrows from the Mary Rose. 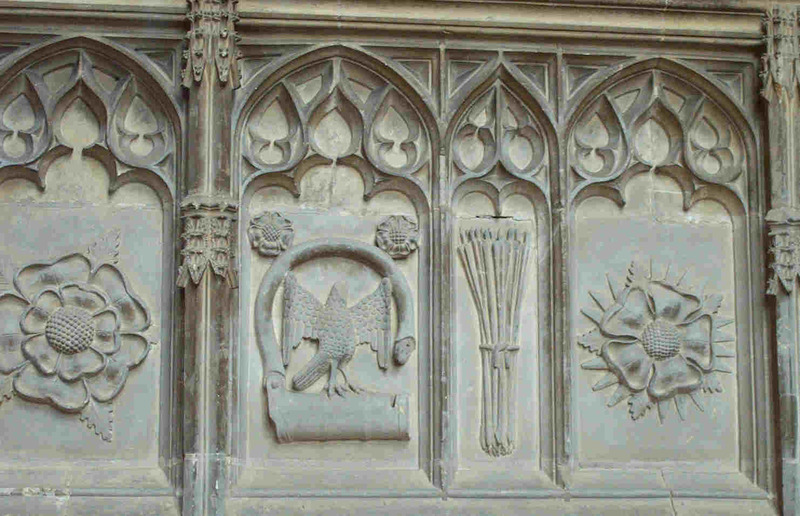 Very similar arrows are shown in the carvings on Prince Arthur’s Chantry Chapel (1504) in Worcester Cathedral. Some of the carving on Prince Arthur’s Chantry Chapel in Worcester Cathedral. Note the curved trailing edges on the fletching and the Tudor bodkin heads. Click the photo to embiggerate. Jessop M2 head from Medieval-Fightclub, bob-tail tapered 29″ mountain ash shaft, 7″ by ½″ goose fletching, horn cross-nock, red linen binding, rosin/beeswax glue used over binding. This arrow complies with the current Welsh Warbow standard.